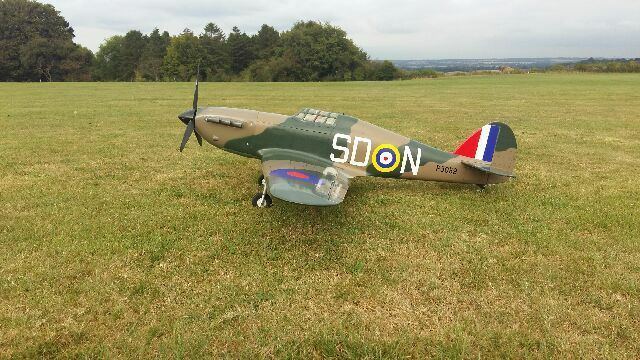 Anyone built and flown the 59inch hurricane by blackhorse. Picking one up next week and running electric. Built (well as much as you can with an ARTF!) and can't say I am that impressed with the covering quality (not as good as previous BH models IMO). Resident club guru did the maiden and trimmed it in with a couple of clicks here and there and pronounced "nice". Summary, nice plane, quality good and flies well although a bit of a challenge for me, but then again life would be boring if everything was just easy. PM me if you want anything from my build. What retracts are you going to use + any idea's on your set-up? There's very little info out there on these so was going to go on the recommended set up being 6s. I've a nice pulso 4120/20 on a 60amp esc running a 6s 5000mah that will give me around 1400 watts. Whats your auw on a 5s as i'm convinced the manual must be wrong. Retracts wise I've a pair of 90 -120 e-flites that fit the bill and more than capable of supporting the kit. What's the ground handling like , any nose over issues. My AUW is 3.1Kg and I though the manual says 2.8 so not to far off. Don't be confused by all of the manuals on the web for its bigger brother that's more popular with the IC guys. Ground handling is very good on grass (short-ish) with a bit of expected left swing on take off. Landings on flaps 1 are okay, can't remember using full flaps as it flies quite slow anyway. The description of its behaviour sounds like a rearward C of G - is it possible that it has changed (e.g. different battery) since the initial test flight? Most Hurricanes I've had experience of are always just a gnats wotsit away from pitching onto their nose while taxying with a reasonable C of G position. Martin, I'll recheck the C of G and see if I put the mark on the fuselage for the battery location in the wrong place, but looking at the photo the U/C looks well forward and not forgetting it has larger than standard wheels/no oleo covers to catch the grass. What's the KV rating of your motor? mine is 580KV on 5S with a 3 blade 13x8 prop pulling 65A although it does not need quite that much however if you are using 4S you'll be dropping the motor speed by 16% which is a big drop in thrust or hike in current + not sure if you will get a much larger diameter prop on it and it look scale. I initially tried it with a 320KV motor and a windmill of a 3 blade prop (looked pants) and just about made its way around the sky with little margin for anything (Martin might remember the experience as he was on the sticks). What lipos do you have? If you have 6S to hand you should be ok, might be worth remembering I am running a 3 blade prop so does more of everything compared with a 2 blade the same pitch/diameter. My 4s motors rated at 800kv , my 6s one is 550kv. I think i'll get more of an idea when i pick the kit up Friday and have see the frame in the flesh. All my lipos are either 2 ,3 or 4 cell so yes i could make up a 5 or 6 cell combo no probs. I think we have a tendancy to overpower models these days - because we can! Sometimes though dropping down a battery size actaully leads to a more flyable model - true the power is reduced, but so is the weight and with that the wing loading. The model doesn't need to land so fast, there is a bigger speed range overwhich the model can fly and perhaps most important of all you have more "spare lift" available in those vital turns on the approach circuit so less likelihood of flicking. Great point - but just thinking aloud - does adding cells necessarily add weight, though, for a given amount of stored energy? More volts is fewer amps, so less mAh is required for any given flight time? Am I correct in assuming that a 4S 3000 mAh contains the same amount of energy as a 3S 4000 mAh pack? So will a 59 inch Hurricane look scale with a 16 x 10 prop or a 13 x 8? In this case with a 800KV motor with low cell count should not be an issue. PS I don't think they are quite the same physical size either. "Am I correct in assuming that a 4S 3000 mAh contains the same amount of energy as a 3S 4000 mAh pack?" Energy density of lipos is a function of overall weight. Cell count and capacity doesn't figure into it. Our hobby lipos are mostly very consistent in their energy density, especially if you are comparing one cell size of a type and brand with a different cell size of the same type and brand. So if your 4S3000 Turnigy Zippy weighs the same as your 3S4000 Turnigy Zippy - there's nothing in it. I disagree. Higher current doesn't equal higher losses, because any sensible animal would fit an appropriate motor, an appropriate motor for higher current would have larger wires of lower resistance. It all comes out in the wash, as the saying goes. Or possibly, you don't get something for nothing. You might note losses vary with current squared, but resistance follows a similar law with wire size. Similar to lipos, with the same weight copper in one motor vs another (of same physical dimension but different kv), you won't win one way or the other. Ultimately to get the same power on two different winds, you've got to create the same strength magnetic field with the same amount of copper in the same physical space. But the power required to keep the model in the air = voltage * current = constant. Therefore, there is absolutely no reason to choose one option over the other, in terms of flight duration or weight. However, with an extra cell, there is the capability to have more power when needed, even for just a short portion of the flight (e.g. take-off). In the I.C. days, the advice would be: "if in doubt, go for the larger option, you can always throttle back, but you can't get more power from a smaller engine". I just wondered why the advice seems to be different for electric. Is there a technical explanation, or have we just lost the discipline to throttle back? I disagree. Higher current doesn't equal higher losses . . .
For that to be true you also then need to use larger wires between the battery and the ESC and the ESC and the motor, probably bigger connectors (so they have a lower resistance), and an ESC rated at a higher current so it also has a lower resistance. "Therefore, there is absolutely no reason to choose one option over the other, in terms of flight duration or weight." Absolutely. Or to put it another way, don't get hung up over cell count, its the lipo weight that counts. "have we just lost the discipline to throttle back?" if you didn't throttle back your IC, it still came down in one working piece, after a slightly shorter but faster flight. "However, with an extra cell, there is the capability to have more power when needed, even for just a short portion of the flight"
No. In our hypothetical equal (yet higher cell count) setup you have fitted a correspondingly lower kv motor, to maintain parity with the power of the lower cell count setup. So full power in one is the same as full power in the other. Simply swapping a lower cell lipo for a higher cell lipo, if the lipo weights are equal, doesn't buy you the "more power". You could overprop either setup equally well (or with equally smoky results). Mike, yes, to all of those, and therein lies the fly in the ointment of the higher current side of things, increased ESC & wiring weight. But Chris comment related to motor wiring. As did my first reply (disagreement?). To give some importance the the resistance outside the battery and motor, it is quite possible to find the total resistance of the wires, connectors and the ESC to be 20 mOhms (0.02 ohms). Consider a 3-cell lipo delivering 40A compared to a 4-cell lipo delivering 30A (the same total power). The voltage loss in 20 mOhm for 40A is 0.8V, while for 30A is 0.6V. Using a nominal 3.7V per cell, this is 7.2% of the 3-cell battery voltage, but only 4.1% of the 4-cell battery. For higher currents, the difference is greater. Well, we can do the calculation to find out! The amount of charge in the battery would be 3 columbs per second for one hour, so that's 3x3600 Coulombs. Or 10800 Colombs. The energy in the battery is given by the formula E=Q x V, E is the enegy, Q is the charge and V is the voltage. So that's E=10800 x 14.8 or 159.8kJ. The amount charge in this case is: 4x3600, or 14400 Coulombs. So the energy stored is 14400 x 11.1, or 159.8kJ. With the 3s the current needed to deliver 500W is 45A, at that rate we have 4/45, or again 5.3 mins - so endurance is the same. We don't get a gain. And we will find the weight of the batteries will be very similar too. Because weight is governed by energy density and as both batteries are LiPo technology that will be th same. But, and this is the point really, what I'm talking about is accepting a bit less power as a trade off against battery weight - say going to 450W and a 3s 3000mAh - now we can get significant weight savings for often little degradation in either performance or endurance. We seem to have digressed rather significantly from the OP's request for information about the BH Hurricane! My recollection of Chris's model was of unexciting performance from his original power set-up but steady and predictable handling - no apparent vices and a pretty "sit" in the air. He'll no doubt remind me but I can't recall flying it with the more powerful power train. Wandering back OT, I think Mike makes a good point about the voltage drops in the wiring - remember that most people will not uprate connectors and wiring when operating with lower supply voltages and consequently higher currents for a given power rating. OT?? I'm not in this Thread. Who do you mean?